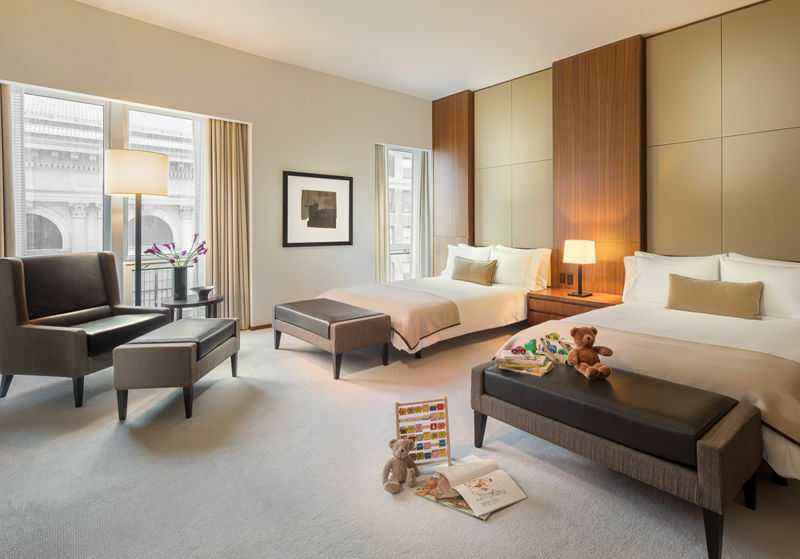 Family rooms welcome kids to the luxurious Langham Place New York. Have you been practicing your forearm in preparation for a week of couch-potato viewing (August 25 – September 8, 2014) of the U.S. Open this summer? Tennis buffs and even occasional fans love watching the competition at the Arthur Ashe Stadium Court, where the sport’s best international pros compete for the final Grand Slam title of the year. If so, here’s an opportunity to visit the site of this legendary annual tennis tournament, see the opening night games in person, and hobnob with the sports’ top stars. Just toss your wallet into your tennis tote, bring a change from the whites-soled shoes and you’re ready to party at New York’s luxurious Langham Place, Fifth Avenue. Accommodations in a luxuriously appointed 1-bedroom suite at Langham Place, Fifth Avenue for 5 nights. Two tickets to Taste of Tennis on Thursday, August 21, the world’s premier culinary and tennis experience, where famous tennis stars are matched with equally impressive stars of the culinary world. Two passes to Party with the Pros on Saturday, August 23, the exclusive kick-off event featuring a menu of hand-crafted cocktails and treats by Chef David Vandenabeele at the hotel’s chic gastro-pub style lounge, Measure. If you’ve got the kids along, book a babysitter to enjoy the private cocktail soiree, where you can meet and mingle with a roster of celebrated tennis stars from around the world, including co-hosts John Isner, Sloane Stephens and Victoria Azarenka. Two tickets to Opening Night of the US Open on Monday, August 25 at the USTA Billie Jean King National Tennis Center in Forest Hills, in the Lagardère Tennis Luxury Suite, including buffet dinner and full open bar. We’ve just learned that Fitz and the Tantrums will headline the night, with the 3 Winans Brothers doing “The Star Spangled Banner.” The band, known for their chart-topping “Out of My League” and “The Walker,” are set to perform three songs, accompanied by wild lights, video effects and projections of classic tennis plays from past U.S. Opens. Sounds like quite a show! Given all the fanfare, of course you’ll want to have limousine transfers to and from USTA Billie Jean King National Tennis Center in Queens, and they’re provided, too. Hotels like the Langham Place just have to think of everything. Tennis fans have other options as well. Emirates Air, the leading airline based in Dubai, is sponsoring a sweepstakes to win U.S. Open tickets by subscribing to their newsletter of upcoming U.S. Open events; definitely worth a try. If this is going to be a family reunion, you may want the trip planning services of Tours For Tennis, a tour operator specializing in the sport who is the U.S. Open’s official travel provider: their website has all the details on what packages with courtside tickets are available. And if you’re into tennis and ready to prep now for the 2015 Grand Slam, the pro’s at Tennis Resorts Online are featuring a roundup of the best Cape Cod tennis camps for families in their current newsletter, so be sure to take a look. What if your family members aren’t really into tennis at this stage of their lives? The newest initiative to encourage interest in the sport is Play Tennis – a public resource hosted by the USTA that will be offering free tennis classes and clinics during the month of September. Visit Play Tennis.com and sign up for notices, start watching the U.S. Open together, and you’ll be surprised at how quickly kids become intrigued by the sport.